With India home to more than 15 million independent workers, companies, both big and small, are hiring more freelancers than ever. After working as a management consultant for 12 years, Sudhanshu Singh felt he wasn't learning much or working to his potential. "I wanted to work in newer areas and on projects I knew I could do best, but an organisational system doesn't give that choice," he says. So, on November 23, 2009 - a day he says he will always remember for regaining control of his life - he bid adieu to his job and turned freelancer. In these six years, he has had enough projects to keep him busy, earns a decent amount, gets time to read, and is pursuing PhD in hospital management. Singh is not alone. In fact, he is part of India's '15-million and growing' freelancer population, according to estimates from Truelancer, an online marketplace for freelancers. This is just after the US, which has 53 million independent workers, as per data from the U.S. Bureau of Labor Statistics. The global market for freelancers is worth $2-3 billion, of which India accounts for $1 billion, according to Truelancer data. The global market has been growing at 14 per cent a year for the past few years. While it is clear that rising internet penetration and use of technology for remote work have given people an opportunity to escape the grind of a regular job, freelancers, it turns out, are not the only beneficiaries of the trend. Companies, even big ones such as Ernst & Young, are also adding tremendous value by giving out specialised jobs not done throughout the year. And for start-ups that cannot afford to hire full-time staff, the trend is nothing short of a godsend. One reason companies are tapping outsiders for even important work is high wage inflation and rising costs and complexity of training people and providing infrastructure. Compliance, for instance with provident fund and tax rules, is also an issue. "India has had double-digit salary inflation for a long time. The global average is 2-3 per cent. This has steadily increased the cost of doing business," says Padmaja Alaganandan, Partner and Leader, People & Organisation Practice at consulting firm PwC. "Companies are increasingly focusing on non-linear models where the targeted rise in revenue does not translate into a similar increase in the number of full-time hires or the overall compensation cost," she says. "All companies can outsource 10-25 per cent workforce if they think about the supply chain strategically," says Manish Sabharwal, Chairman and Co-Founder of Teamlease, a staffing company. Trends suggest things are already moving towards this. "We will see large organisations retain core teams, and potential leadership talent and use external resources in roles that require hyper specialisation and skill sets that are niche and unviable to build internally," says PwC's Alaganandan. Take Bangalore-based IT infrastructure and cloud services company Microland, which uses freelancers for senior roles too. Its corporate communications leader, for example, is an independent consultant. "We hire independent consultants when we need specific skills for a short duration. We sign an agreement that they will work only for us during this period. This way we get the best talent to work for us without conflict of interest," says Founder and MD Pradeep Kar. This, he says, works well, as these are experienced people and don't need to be told what they are expected to do. Edureka, a five-year-old online learning platform, has built its entire business around freelance teachers. It has 500-plus instructors on its platform who moonlight the courses on weekends or in evenings. "We don't have a single in-house instructor. Hiring full time will not work, as in such a case I will have to pay crores in salaries, which isn't viable," says Co-Founder and CEO Lovleen Bhatia. "But I don't have freelancers in my core teams of technology and data security as here the main roles are ideation and business development, which are not clearly defined, due to which there will be practical challenges in delegating and defining the output required," he says. However, start-ups and smaller companies are giving even their core work to outsiders as they may not be able to afford high-quality talent on a full-time basis. Over 40 per cent companies that have registered projects at the New Delhi-based online freelance marketplace, Flexing It, are start-ups. Take Gurgaon-based bus aggregator Shuttl, which has been using freelancers for working on the user interface of its app and content creation for marketing. "Using freelancers for creative work helps as they bring fresh perspective," says Co-founder Amit Singh. It had earlier outsourced the development of its iOS app. "The app was to be a replica of the Android version that we had already developed. We outsourced it as we wanted our team to focus on core problems rather than tasks that are fairly standardised." It has a pool of eight freelancers it gives work to regularly. Even the government has announced that it will hire freelancers to digitise documents under the Digital India Platform. Dipesh Garg, the Founder of Truelancer, says the Singapore government has also contacted them for hiring freelancers. Earlier, the freelance model existed mostly in the services industry. Now it is there in all sectors, including fast moving consumer goods and auto, as companies tap external talent, including suppliers, distributors and research experts, says PwC's Alaganandan. Another big change has been in the nature of work. Earlier, most jobs involved data entry and other low-value work. There was nothing for executive roles, says Chandrika Pasricha, Founder and CEO of Flexing It. Now, a number of companies are also outsourcing hyper-specialised jobs that are part of high-value projects. Freelancers are no longer perceived as ad hoc workers but professionals who can play a key part in a business's growth. Flexing It has a team of just 17 people and gives executive roles such as Senior HR and Design Head to independent consultants registered on its platform. Public relations, content development and accounting are also handled by outsiders. Similarly, Truelancer has a core team of seven people for customer support and product development. The rest of the work, content development, graphic design and digital marketing, is done by 10-15 freelancers. Professional services firm Ernst & Young uses its pool of 300-plus freelancers for projects that require specialised skills. "For project-based work, demand comes in spurts, and so there is merit in working with freelancers, especially on niche projects, as they are experts in their domains," says Sandeep Kohli, National Director, HR, E&Y. However, trust remains a concern. "We are uncomfortable using freelancers due to accountability issues. If one day they come and say we are not working on the project, what will we tell our client?" says Parthasarathy N.S., President and COO of Mindtree, an IT consulting firm. Mindtree uses freelancers only for internal and short duration projects. It is this trust gap that online marketplaces such as Truelancer and Flexing It are trying to fill. Flexing It has developed a patented algorithm, FlexScore, to map skill sets with projects for helping companies find the best talent. It has 17,000-plus freelancers registered with it for management roles. "The marketplace model brings legitimacy to the space. Trust has been a big issue and these platforms, with their review systems and curation models, are trying to close the loop and organise this very disorganised space," says Ranjan Biswas, Partner, E&Y. Truelancer has made it mandatory for companies to give feedback on the work done. This helps freelancers build their reputation. Also, at the start of the project, the company has to deposit the entire amount with Truelancer, which pays the freelancer upon completion of the work after charging 10 per cent of the amount as fee, says Garg. Truelancer has 250,000 freelancers on its platform. Of these, 112,000-plus are from India. The listing model of these platforms also helps the freelancer and the companies know the going rate for particular projects and skills, making the process transparent. Flexing It has developed a fee benchmarking tool, Feebee, that helps companies and workers arrive at the price, says Pasricha. With such tools, one can check the price and know projects for which there is high demand. Earlier, the price used to be determined by negotiations, and it was a big grey area. Freelancers also use several globally popular sites such as Elance, Upwork and Freelancer.com. Survey after survey has shown how people, even the ones with no experience, want flexible working hours. Around 58 per cent Indian freelancers are less than 30 years old, according to Truelancer data. Take Rahul Rakesh, 25, who turned freelancer after doing BBA. "Since childhood I was clear that I would not work under someone," he says. He has been writing extensively under a pseudonym. He used his articles published during his school days to get content writing and statistical research work in the beginning. Now, he has a network of freelancers he gives projects to if he is not able to handle the workload. "A regular pay check is not a big priority for today's workforce compared to learning new things and making full use of the available growth opportunities. Job security anyway is a myth and employment has shifted from being a lifetime contract to a taxicab relati-onship. In fact, after the move to cost-to-company that monetises all benefits, there is not much difference between freelancers and salaried folks," says Sabharwal of Teamlease. 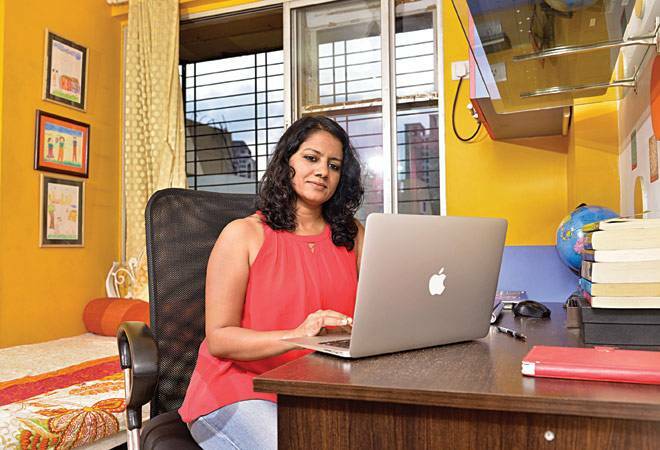 Nivedita Jayaram Pawar, 41, an editor-turned-freelancer, however, feels that this freedom comes at a cost. "You have to get the pipeline of projects right to manage the cash flow well. There are months when I can do more but don't get much work." She was Bureau Chief at Images Multimedia, a publishing house, before she called it quits in 2013 to spend more time with her daughter. But the work, she says, has several positives. "I'm writing a lot more, which is what I wanted to do. In the editorial role, I used to spend most of my time delegating work and ensuring that the magazine hits the stands on time. I am a lot happier and content with my life now." Not that all this is easy. Freeelancers are, after all, micro-entrepreneurs, responsible for getting work, managing clients, networking and promoting themselves. "You have to set personal targets. I contact at least two new publishing houses every month. I also maintain a blog and am active on Twitter," says Pawar. "The most important thing is discipline. You have to have a time table and an absolute commitment to deadlines. Only then can you get repeat clients," says Devraj Lahiri, 36, an IT analyst. He juggles between photography, writing and teaching quantitative aptitude. He says he earns one-third of what he used to but "will never go back to his banking job".